Instead of focusing on getting those last few chapters of my book done, I’ve been finding anything and everything I can to avoid working on it. Given there’s no deadline, it’s not essential to I finish until I’m ready, and so it doesn’t really matter. That said, I was musing the other day that my blog has the title of On Writing Dragons, and I haven’t ONCE written about dragons. When I started the blog, I decided I would limit the actual discussion of my story to a minimum. With that in mind, I’m not going to talk much about the dragons in my story, at least not until the first book is published (see that -I’m being optimistic today!) Anyhow, I figured now is as good a time as any to broach the subject. Some time ago I saw a blog, not the first and probably not the last, discussing considerations of the biology of magical creatures, like dragons. 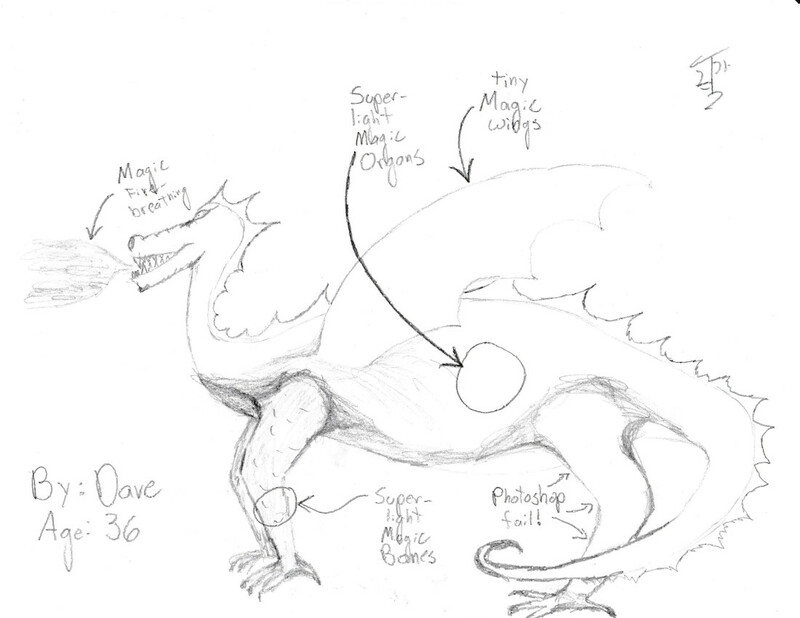 I’ve supplied a figure (figure A) for discussion on the biology of dragons. Now, there are a ton of problems with dragons, what do they eat? How do they fly? How do they breathe fire without combusting? First, consider that the wings are entirely too small to lift a 25 ton animal. The question of how much thrust is needed and the required surface area of the wings is the sort of thing to ask on ‘what if?’ Over at xkcd -Someone should do this, because it would be awesome reading in his next book, which I will buy, even without an answer. I suspect dragons would require jet engines. It turns out that dragons have some features that make it work out. I’ll draw your attention to the super-light bones and internal organs (Fig. A) Even then, they’ll likely to be too heavy to take off. Good thing their tiny wings are also magical! What about the fire-breathing? Again, I draw your attention to Fig A. Note the magical internal organs. Somewhere in there is a magical gizzard that makes the fire -probably. These magical organs also provide far more nutrition from any meal than would be ordinary. Thus, a sheep or cow every now and then is satisfactory. In conclusion, dragons are magical, fictional creatures, well accepted in all varieties of fantasy. Their biology is magical, and irrelevant to the story you’re telling, unless your protagonist is studying dragon biology. Even then, trying to explain it removes the magic from the story, so don’t bother worrying about it. This entry was posted in advice, dragons and tagged about dragons, advice on writing dragons, dragon biology, dragons, fantasy novel, fantasy writing, how do dragons fly, tiny magical wings, what do dragons eat, writing dragons. I’m sending the writing DI over here to straighten you out. He’ll get you writing. I’m not sure why you promised not to share your story! I’d love some hints and tidbits, some teasers. I think too many authors blog about writing and seem to avoid the elephant in the room- what are they working on? I enjoy reading short stories or chapters! When you blog writing samples, there are three options for people to respond. Some people may just blow sunshine in their responses. They might be sincere. Maybe they’re “If you can’t say something nice” people, so they think nice = helpful. Then there’s honest feedback people. As I understand it, you submit to honest feedback the moment you publish, because that’s what you’ll get in reviews, assuming anyone even sees your book. People who might honestly help you -probably- are going to want compensation of some kind because that’s their job and giving out free advice isn’t the best way to pay the rent. Nevertheless, some writers also don’t want the honest feedback. Why open yourself to strangers on the net when you cannot vet their ability to criticize honestly or usefully. Some people may have awesome insights, others, not so much. The crickets crowd, maybe they either didn’t read it (TLDR) or they didn’t care for the story but chose to say nothing. Negative comments seem to garner bad reputation so there is the problem. I posted a writing sample. It really needs a revision, but it is what it is. It gets a lot of people looking at it (in relative terms on my blog, a lot is 4 people a day), but nobody clicks the like button or comments. Self-doubting moments follow. Where are the blowing sunshine people? Honest feedback? (“This looks like what dribbles out the nether end of the–“). Guess it wasn’t the high quality stuff I thought it was. And they’re probably right, since I scrapped that story line (no conflict, and the MRUs weren’t very good). Back to honing my craft. I have considered it, and I did put my prologue out there as a ‘proof of writing.’ There are two main reasons I don’t. The first is that I’m super protective of certain elements of my work. Once I’m ready to put it out there I’d like to do it with a proper copy-right, or at least as a proper teaser that could be linked to obtaining the whole work. The second is that I’m also a bit of a perfectionist -I’m not claiming I’m Hemingway or anything, just very exacting on myself (in certain circumstances). I am extremely reluctant to put something out in the world that I don’t think is ready. Of course, there are the items Pontius points out. If I got honest, helpful feedback, that would be great, and I might be inclined to post segments of story, but I don’t expect it, and I also tend to over think every bit of advice and criticism, which comes with lots of questions and what-ifs. I suppose the main reason I’m out here at the moment is to help improve my own writing (not that I don’t also enjoy seeing what others are up to, I do enjoy that as well). Just writing about writing, and hearing other opinions has already been more helpful than reading any number of books on the topic. It forces me to develop an opinion on gritty topic that I might otherwise not think about. However, I also don’t like to ignore advice, and so, when I’m ready, I might post some ‘proof of writing’ teasers or snippits out there, and maybe soon. I’ve found myself in the same place. Wanting to protect what I write. Feeling it isn’t ready for other’s to read. Knowing I need to polish and primp and shine before letting anyone read my creation. The need for protection is real, both for copyright issues and personal ones. I don’t believe its a good idea to share one’s work before they are ready. We, as authors, have to develop thick skin to withstand the storms that arise when people give negative feedback. That being said, it’s a great way to grow as an author. I wrote in a vacuum for three years and when I approached my first agent, I had no idea what to expect. Was it a good story? Would she see my vision? Her feedback was invaluable – get some beta readers. Get some feedback. Now that I have a few years (and completed drafts) under my belt, I’m comfortable sharing my story with others. I meet with a local writer’s group and load my stories onto Wattpad to develop readership. Yes, both are risky. But so far the reward has been worth it! I’m glad you’re finding it helpful to write about writing. I’m finding the same thing. It’s good to support each other, sharing tidbits and such. I just wish a few more would share their writing too. I’d like to support them the way I’ve been supported! Ultimately, it’s your journey. I encourage you to take advice as you see fit. I’m just a curious person, and it’s all your fault -now I want to read about dragons! Also, for the record, “Photo shop fail” is funny. This is now my desktop wallpaper. Now that I think about it, putting “wallpaper” on ones “desktop” does not make much sense. Who decided to combine those terms, Microsoft?